I’m back! I’ve changed … and I think for the better. I’ve become a little bit older and hopefully a little bit wiser too. A wise man once said, “no one realizes how beautiful it is to travel until he comes home and rests his head on his old, familiar pillow.” So true. My travels took me to many fascinating places in India. I remember sleeping in mountain caves, on a dilapidated bench in a bus depot, on the cold floor of a village school, in tents under the watchful eyes of Mt. Kanchendzonga and even on the edge of a cliff! Not once did I long for my warm bed at home while I was there. However, now that I’m back from my four-month long trip and sleeping in a warm and comfortable bed again, I’m missing those places. I’ve traded adventure and excitement for boring old comfort. I wouldn’t call my trip a “vacation”. It was more than that. It’s as if I went to the ‘School of Life’. I learned things that are not taught in any school, college or university. The most important lessons that I learned were by observing children. Especially those in the remote villages. The lessons being – how to be happy and how to relish life’s simple pleasures. It was heartwarming to see children getting excited and laughing by seeing their own digital picture. Also, a great way to experience inner peace is by watching a sunrise or a sunset – an everyday phenomenon! So many events have happened in my life in the last four months that I don’t even know where to begin. I feel like I’ve been away for at least a year. When I returned and saw my old colleagues; it was as if nothing had changed. Time had stood still while I was away. The rat race, office politics … everything was still the same. Resigning from a “well-paying” job wasn’t an easy decision and people certainly didn’t make it feel like I was doing the right thing. There was a lot of opposition. I was asked to consider my yet-to-be-determined year-end bonus, a promotion, falling behind in my career, and someone even talked about the ‘opportunity cost’, which was incidentally around $20,000! However, no amount of money can buy what I’ve gained during the time I was away from my job. I wouldn’t trade it for anything. I always had the support of my family, who have gotten used to my craziness, and were only worried about my safety during my many expeditions, which they knew I would undertake. This tiny mountainous Indian state is endowed with natural beauty such as I’ve never seen before. With elevation ranging from 920 feet to 28,166 feet, it is one of the most geographically diverse places on Earth. There was a sign on way to Gangtok (Sikkim’s Capital city) that said, “Sikkim: Switzerland of the East”. I think it’s an insult to compare Sikkim to Switzerland. The mighty Himalayas simply cannot be compared to the Alps. The Himalayas are incomparable. Looking up at Mt. Kanchendzonga, the world’s third highest peak, I felt like all the troubles I had to undertake to get here were worth it. It’s a humbling experience and makes one philosophical. One realizes how insignificant we are and such meaningless lives we lead chasing some elusive “title” at work. And how can I forget my team? The camaraderie had begun right from day one. A special thanks to Raj for arranging the most memorable trek of my life and also to Shyam, our cook, for bringing back my lost camera (actually, memories)! Going to see Mt. Kanchendzonga is not without its perils. I had several symptoms of HAPE (High Altitude Pulmonary Edema), a form of AMS or Acute Mountain Sickness. At the highest points of our trek, I experienced minor headaches, shortness of breath without exertion, loss of appetite, disturbed sleep (nightmares) and collection of fluid in hands and face (resulting in swelling of the face, fingers and hands) – all signs of HAPE. I also had a major fall while in Gangtok. I slipped and fell off the slippery hotel stairs. This was after successfully completing the Kanchendzonga trek. For several seconds after the fall I did not move due to fear of discovering that I’ve broken my back. I thought the last trek of my life is over and I’m going to be spending the rest of my life in a wheelchair. It was scary! Luckily, I was fine. There were no injuries. However, I do feel like my back is a bit weaker now. This was, by far, the most difficult trek of my life. It was less trekking and more mountaineering. We were ill-prepared for it, or at least I was. I knew it was a challenging trek, but I had underestimated the degree of difficult, and therefore, risk, that was involved. On top of that, we did not have the proper climbing equipment. Except for a rope, we did not have a harness or carabiners, which are essential for rock climbing. The sun was unbearable and relentless. My haversack weighed around twelve kilos. I had come directly from another city and did not get a chance to go “home” and dump all the unnecessary stuff that I was carrying. I had a hard time climbing even a small hill. Upon reaching a village, I decided to hire a porter to carry my bag. He said he would only come until the start of a ‘ghali‘, and not all the way to the top. According to him, the ghali was only 1.5 hours away. At our pace, it took us more than four hours in the scorching sun. I got my money’s worth and gave him a good tip. The ghali was where the real adventure started and it was already evening by the time we reached it. It was one rock patch after another. A midst falling rocks, we could not even think of camping anywhere. Rock slides of last season’s rains had blocked the route. We lost the way. Finally, at around 10 PM we were too tired to go any further and decided to sleep on the flattest surface that we could find, which happened to be at the edge of a cliff. I fell asleep instantly as I was very tired. My friend, Shailesh, stayed up as he was afraid I would roll off the mountain in my sleep. We woke up with fresh zeal and after some more risky mountaineering we finally made it to the top. It was a great feeling! There were so many places where we could have died. I promised to not knowingly put myself in that position again. The risk was not worth it. For the first time, I was afraid on a trek. I tried very hard to take fear out of my mind, and put on a brave face. Once fear manifests itself in the mind, we make mistakes that could turn out to be fatal in the mountains. My grandmother visited India in November and I was lucky enough to spend a lot of quality time with her. She passed away soon after returning from India. I miss her and will always cherish the time I spent with her in Pune. m told me about what had happened in Mumbai the previous night. Since I didn’t have a TV, I had no idea. I rushed out to buy a newspaper, The Times of India (ToI), and was shocked to see no trace of the news my mom had told me about. How can India’s national newspaper not have anything on a major event that had happened at 9:30 PM the previous night? It wasn’t too late to make it in the papers. Even the cricket scores in ToI were outdated. All other newspapers had the news as headlines. Looks like all ToI reporters don’t have a TV either! Shame on ToI! I wish Indian politicians would end the disgusting diplomatic game they are playing with Pakistan. The politicians are often heard referring to the terrorists as “elements from Pakistan”. Why not just say Pakistani terrorists? That’s what they are. And why is India hell-bent on providing “proof” to Pakistan that the terrorists were Pakistani? What is Pakistan going to do with the dossier of proof? They are going to have a good laugh for sure. Pakistan is a state-sponsor of terrorism. Whether the United States labels it as that should be irrelevant. India should stop the diplomatic game and simply take out the terrorists camps in Pakistan, a la Israel. I think India should start ruling with an iron fist like China. It is shocking that so many Indian Muslims are not patriotic and sympathize with the terrorists. They even refuse to sing India’s national song – Vande Mataram – because it is against Islam. Fatwas are issued by Muslim clerics and Imams against singing the national song. These people should be picked up and sent to “re-education” centers, or better yet, deported to Pakistan. It is time for Indians to shed their secular image and be more nationalist. Otherwise there will be more Islamic terrorism. Dalai Lama recently said that the terrorists are not going to stop by adopting the Gandhian ideology of ahimsa (non-violence); they are too narrow-minded for that. Prevention is the best defense, and that means taking out the terrorist camps that are operating openly in Pakistan. MLM is everywhere in India. One cannot miss it. The ads to make an extra Rs.10,000-15,000/month can be seen everywhere: bus stands, newspapers, lamp posts, post boxes etc. The ads are often advertised as legitimate “jobs”. I suspected all along that these were MLM, but I wanted to confirm and have some fun. Since I had the time, I called the number on one of those ads and arranged a meeting. My suspicions were confirmed when the person asked me what time and place was convenient for me. We decided to meet near a park in the evening. It was the two of them. The person whom I had spoken to on the phone introduced the other person as someone who had joined his “team” recently and made so much money that he had even bought himself a car. Apparently they had come to see me in his new car. I asked them about what their company does and they refused to tell me anything. They insisted on me buying a ticket for “only” Rs.50 and attend a seminar on Sunday where all my questions will be answered. Then I asked them to tell me the name of the company they worked for so I could lookup some information on the Internet. They refused to divulge that information! I was having too much fun at that point. I asked them point-blank if what they do is a MLM gimmick. They insisted on me attending the seminar. Finally, after thirty minutes of talking they admitted that it was indeed MLM, but asked me what was wrong with it! Well, if it is so good they wouldn’t have to lie and manipulate. People would come flocking to them, instead of running away. We ended the so-called meeting and I saw them loiter around and then take off in a bus. Goa often comes to mind when one thinks of great beaches in India. However, for me, it is now Konkan! 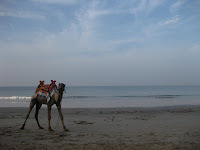 Konkan is home to several sea-forts and some of the best virgin beaches I’ve ever seen. I also got a chance to drive for the first time in India. I drove around 200 kilometers. Driving in India is a multi-tasking job. One has to worry about the cyclists, the ST buses, the slow trucks, the erratic motorcyclists, the dogs, the potholes, the narrow roads, the children, the speeding cars, the cows and buffaloes! One thing you do not do while driving in India is check the rear-view mirror. There’s no looking back. I loved it! I would love to explore more of Konkan in the future. It’s interesting how mountains connect people. I met Chetan et al back in November 2006 on our first trek together, to Alang-Madan-Kulang. We met through an online trekking community. Chetan has been organizing major treks in the Sahyadri mountains since 2006 and I’ve been lucky enough to be a part of those since inception. 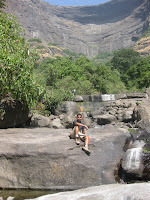 This year he had organized a five day affair with the Sahyadri mountains in the Wai region. The adventures and experiences we have had will be remembered for a life time. 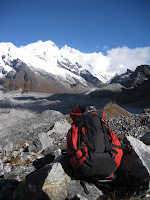 The intensity of the treks is also increasing every year. Only three out of the nine people that started actually completed this year’s trek. We must have walked around 100 kilometers in five days. A chance meeting with Mr. Gogawale, an 81 year old man, living atop Mt. Kamalgad is worth mentioning. He guided us through the dense forest of Koleshwar plateau to Jor village. Born and raised in the mountains, he was as fit as a horse and had stamina of an 18 year old! Many people tell me to stop climbing mountains and I always reply by saying that the mountains keep me young and healthy. Mr. Gogawale is living proof of that. It was my dream to visit the world renowned doctors, Prakash and Mandakini Amte, at Hemalkasa situated in the dense forest of Gadchiroli district in the state of Maharashtra. They had stayed with us back in June 2007. I was quite ignorant about their work prior to that. In fact, I had never even heard the name ‘Amte’ before. I met several people in Maharashtra who still hadn’t heard of the Amtes – at least not until I told them about it! The doctor duo have devoted their entire life for the well-being of the Madia Gond tribal people. I was quite nervous before going there. The main reason being that Gadchiroli district, for all practical purposes, is ruled by the Naxalites (like Maoists). The government has no control over that area. Another cause of concern was the prevalence of cerebral malaria in the region. While on way to Hemalkasa, I asked a local if it was safe to go there and he replied by saying that it was safer here than in your cities. In light of what happened in Mumbai, he was right. As far as malaria was concerned, I decided not to take a course of malaria pills and just hope for the best. Every night after dinner we would sit around the camp fire and he would share some of his thrilling experiences. Dr. Prakash Amte said he trusted the four legged animals more than the two legged ones. He said the love shown by his animal friends, which include animals such as leopards, sloth bears and hyenas, is always unconditional. The unassuming doctors are recipients of the Magsaysay Award 2008. When venturing out to Hemalkasa, I was all prepared to be alone. I didn’t think anyone of my age would be there. However, I was pleasantly surprised to have the company of a group of medical students from Miraj, as well as of a brother and sister duo from Aurangabad. The one thing the Amtes would like to see is more young people visiting Hemalkasa. Currently, an overwhelming majority of visitors are senior citizens. Upon Dr. Prakash Amte’s suggestion, I also visited Anandwan, the “Forest of Joy”. Anandwan was started by Baba Amte (Prakash Amte’s father) for the ostracized leprosy patients, almost sixty years ago. It was a place where the leprosy patients received free medical care and were free to unleash their creative energies. Today, it is not just for leprosy patients, but also for the blind, deaf, mute and the physically handicapped. Baba Amte is no more, but his elder son, Dr. Vikas Amte, has taken over. Today, Anandwan is a place that Dr. Vikas says treats the “normal” people, and not the leprosy patients! It is a place where the people who once upon a time considered leprosy-affected people as cursed, and still do at many places, get to see what the leprosy-affected people are capable of. Anandwan has 139 industries; all run by those affected by leprosy. It was a wonderful trip and I will definitely visit again in the future. I will write more about my visit in another post. I missed Canada while I was away! I especially missed the driving sense that people have in Canada. In India, even the most sane and intelligent person becomes a raving lunatic once he embarks on a motorcycle! The prevailing attitude of motorists is: “rules are for fools”! It is a nightmare to be a pedestrian in the cities. Looking for employment in an economy such as this is going to be more challenging than climbing Kanchendzonga! It’s going to be an experience for sure. Until next time, alvida, my friends!